In the first of this three-part series on the psychology of referral, we’ll look at the concepts of social capital and social risk. The secret behind every successful referral is instilling a greater sense of one over the other in the mind of your customer. Why the decision to recommend is often driven by a desire for recognition and belonging, more than by the financial reward. Why building confidence in the social benefit of participating in a refer-a-friend programme is key. The questions in a customer’s head that you’ll need to answer to create a successful scheme. Human beings are inherently social; a craving for social connection is hardwired into our psychology. This is just as true today as it was thousands of years ago. The emotional reward of feeling part of “our tribe” is irresistible and in order to obtain it we’ll gladly accept the risks involved in taking a social action. But there’s a limit; if the the risk of not receiving a positive response to a social action feels higher than the potential reward, reluctance kicks in. We’re more inclined to stay quiet. Trust in how our actions will be received is at the heart of this social dynamic. If I contribute x to this person or group — how large is the risk of this action being socially ignored or rejected vs. how confident am I that this action will be socially recognised and rewarded? This same psychological dynamic is at play in referral marketing. After all, referring a product or service among friends is an act of social belonging, reciprocity and trust. Here at Mention Me, we’re passionate about this. We help brands build quality and lasting relationships with their customers. Referral marketing with Mention Me focuses not only on the right financial incentive, but also on understanding the power of the social reward. We believe that there are two key factors that increase the chances of a customer committing to a referral programme. We call these psychological balloons. And vice versa, there are two factors that decrease the chances of a successful referral. We call these psychological weights. The more you can inflate the psychological balloons for your customers, and conversely, the more you can lighten the psychological weights, the more likely the chances of referral success. Referrer incentive: do I really want this? In order to act as an incentive, a reward has to hit the customer’s sweet spot; the reward has to be something customers genuinely want. There are many incentive possibilities, from discounts, to third party gift vouchers, to loyalty points or entry into a prize draw. Our experience suggests that money off is the most effective referral incentive, but every customer base is different. Start with a hypothesis about which offers work for your audience, then test, test, and AB test some more to refine and optimise that offer for conversion. Effort required: how easy will it be to attain this reward? Put simply, effort is a barrier to commitment. The easier and more simple you make it for customers to commit to your offer, the fewer objections they will have to making that commitment. This is where creating a frictionless user experience is key. Consider how many steps, or pieces of data you’re asking from your customer in order to sign up. Ask: are each of these absolutely necessary, or could the process be streamlined? Social capital: how confident am I that this will make me look good? 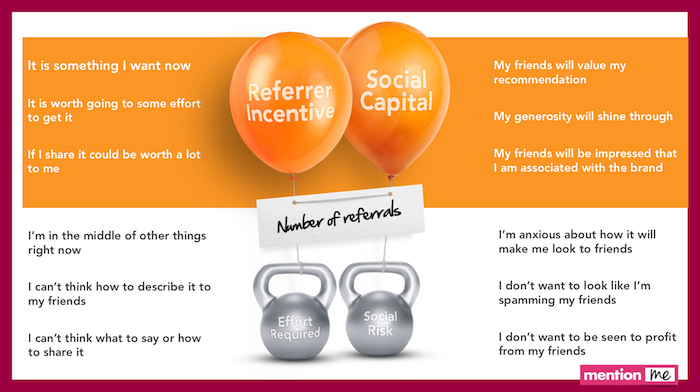 Even more than incentives and a smooth experience, social capital is the absolute key to successful referral campaigns. If you can generate confidence in the imminent and inevitable social reward of making a recommendation your customer will be won over. My friends will love this product/service. My friends will be impressed that I’m associated with this brand. My friends will perceive me as a provider of insider or expert information. My generosity (via the reward they’ll receive), not my self interest (via the reward I’ll receive) is what will shine through. Social risk: how concerned am I that this will be received negatively? If you fail to inspire the idea of imminent and inevitable social gain in your customer’s mind, a feeling of social risk takes its place. This can weigh down your conversion rate. I won’t look cool sharing this … and I want to look cool. I’m worried this will make me look like a spammer. I don’t want to be judged as the cheapskate “special offer” person. 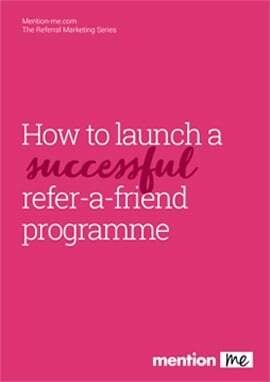 The attraction of refer-a-friend-programmes is not only financial; they tap into a much deeper human need for social recognition and belonging. In order to convince customers to share a referral offer, brands need to understand how to instill trust and belief in its social benefits. Companies that succeed at referral marketing are those that hit their customers’ sweet spot by selecting both the most enticing referral reward, but most importantly, crafting compelling messaging that instills an expectation of imminent gains in social capital. Social capital is the most influential psychological trigger to referral success - and yet, it routinely seems to get overlooked by many marketing teams. Often, this is because companies are laser focused on the mechanics of the incentive itself and on creating a seamless user journey around it. They miss out on the “heart and soul” of the offer: the emotion-fuelled psychological factors that really convince customers of its socially beneficial outcomes. Remember: more than benefits, more than features, we are driven to become a member in good standing of the tribe. So how can you make sure your refer-a-friend campaigns achieve that? Good question — our next two posts in the series will focus in on some of the specifics of the psychology of referral, explaining how to frame and embed your campaign’s messaging in the principles of the psychology of persuasion, positive reinforcement and compelling calls to action.